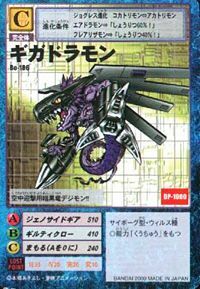 A dark dragon Digimon developed at the same time as Megadramon. As a combat dragon that was armed to the teeth by further remodeling, its existence is the epitome of a fiendish computer virus. Its Signature Move is waging attacks with the Giga Hands on both of its arms (Guilty Claw). Its Special Move is firing countless organic missiles (Genocide Gear). — Digimon Adventure: "Bombing Mission! Mugendramon"
| Giga likely refers to a gigabyte, a unit of measuring data. Anime/Manga Digimon Adventure: "Bombing Mission! 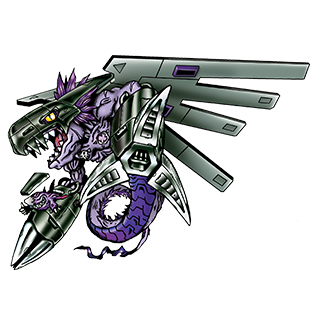 Mugendramon"
Genocide Gear  ジェノサイドギア Jenosaido Gia Darkside Attack/Genocide Gears/Gigabyte Wing/Giga Byte Wing/Genocidal Gears Shoots a barrage of missiles from its claws. Radiates a heat wave from its body. Fires energy beams from its hand. 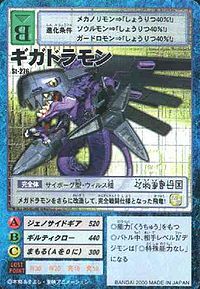 Guilty Claw  ギルティクロー Giruti Kuroo Guilty Wind/Evil Claw Attacks with the Giga Hands, or uses them to send a blade of air at the enemy. Gigadramon (left) and Megadramon from Digimon Adventure. Gigadramon and Megadramon were part of Mugendramons Metal Empire. Together they executed Mugendramons Plan Z by destroying several buildings where the Chosen Children could have been hiding. 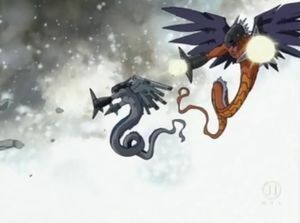 Gigadramon was attacked by Angemon and disappeared. While Gigadramon does not appear in the game naturally, it is possible to obtain it via Game Shark and cheat codes, as it appears as a Perfect-level Data type Digimon in Digimon World. Gigadramon cannot be obtained in any natural way in the game but inner data found that it was originally intended to be obtainable and that even its personal Digivolution Item, the Giga Hand can also be acquired via cheat codes, which if given to any Adult level Digimon, it will automatically evolve into Gigadramon. Other Digimon are obtained in a similar way, those being Panjyamon and Metal Etemon. Gigadramon is an obtainable Digimon. Evolves from Deltamon (6+ DP) or Devidramon (0+ DP). Evolves from Aquilamon at level 24. Evolves from Devidramon if above Level 39, Attack is above 194 and has over 4400 Machine Exp. Evolves from Tankmon if above level 29, Attack is higher than 169 and Speed is higher than 119. They further modified a Megadramon and turned this flying dragon into a perfect battle resource! This explosive dragon of darkness has been reconfigured and is fully armed!! 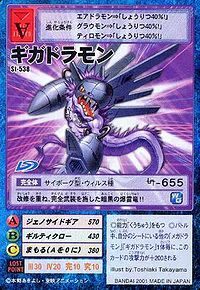 This Genocide Dragon of steel annihilates the target with its unceasing barrage of bomb attacks! 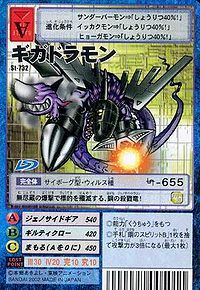 A dark dragon Digimon used for air interception! !